In 2014 I worked extensively with LM Potencies, also known as Quin potencies or 50 millesimal potencies, and it has forced me to reexamine the way I have been prescribing centesimal scale remedies. With homeopathy, as with most things, there are no definitive answers as to how things should be done. Here, I am referring to how much of the remedy to give, how many pellets to use, how much water to dissolve it in, whether to use a wet or a dry dose, how many teaspoons or tablespoons of water the person should drink. A lot of this understanding comes from experience, or the teachers you have been influenced the most by. One can also look to Samuel Hahnemann, the founder of homeopathy for guidance in his great book, The Organon of Medicine, but he also does not give definitive answers, but gives general guidelines (such as dissolve the pellet in 7 or 8 Tablespoons, or use one or two pellets). You will not meet two homeopaths who have the same opinion on this subject, and also the opinion of the homeopath may change from year to year, or month to month. Up until recently, my primary influences have been James Tyler Kent, and the American and European homeopaths of the 19th century, who prescribed mostly high potency remedies. Many of these homeopaths began with the 30C potency, which they considered to be low, and progressed to the 200C, 1M, 10M, 50M, CM, and beyond. The goal was to achieve rapid or dramatic cures, and there wasn’t an overwhelming concern with avoiding aggravations. In the first years of my practice I used the high potencies in this range a few times, and I quickly learned that I do not want to go there. The aggravations could be frightful, so I stuck with the low range, namely the 30C, 200C, and very rarely would I prescribe a 1M strength of the remedy. People did and do aggravate from these potencies, and I had grown to expect this as par for the course. For many years I did use 3 pellets for the average dose of the small size pellets when prescribing a 200C strength remedy. Then a materialistic mind set set in and I began to increase the number of pellets gradually to 5, 6, 8 and even ten pellets for a dose. People were helped by the remedies, and most of the time did experience aggravations. (Since writing this article I have experimented a lot with different pellet quantities per dose. These days I am using 6 to 8 pellets for most adults, as I find people tend to relapse too early when I use fewer pellets). I am always giving the remedy diluted in water. In 2014 I took Will Taylor’s Posology Class on Whole Health Now, and I learned a lot. Hahnemann, the founder of homeopathy, was extremely concerned with posology, and administering the minimum dose, the smallest stimulus needed to set a healing process in motion, while being as gentle as possible, meaning minimizing or avoiding aggravations if it could be done. Most of the time he prescribed the 6C potency of the remedy, which would be considered very low in our day and age, and only toward the end of his life did he prescribe the 30C strength. He only used the 200C strength a few times. He would also use only one globule of the remedy, always dissolved in water. Hahnemann taught that you should never repeat the remedy without altering it slightly. He believed that the body would not tolerate an identical stimulus without some negative effect. He accomplished altering the dose by succussing the bottle that held the remedy. He was devoted to the ideal of gentle cures, and minimizing aggravations. He did not want to add to the patient’s suffering, but to relieve it. The homeopaths in the world prior to 1921 followed the 4th or 5th edition of the Organon of Medicine, which taught the centesimal method of administering remedies. Toward the end of Hahnemann’s life he wrote what is known as the 6th Edition of the Organon of Medicine, where he teaches about the LM potencies, which he called “Medicine au Globule.” This was published posthumously almost 80 years after his death. I had used LM potencies from time to time with many of my clients over the years, but it was not till last year where I really put my heart and soul into trying to understand them and how to work with them. This experience has given me a different perspective on centesimal scale remedies, and their strength and power. and how much would constitute a safe and gentle dose. I learned a great deal by taking LM potencies myself, and learning about aggravations on LM potencies, and how to adjust the size of the dose, and the frequency of administration to minimize aggravations and maximize the therapeutic effects of the remedies. An LM1 potency corresponds to a 6C potency in the centesimal scale. If Hahnemann recommended using only 1 poppy seed sized granule dissolved in (7 or 8 TBS of water), which is about 100 ml of water, or 4 oz. of water in the stock bottle, and then had the patient take only one teaspoon of that and pour it into a separate cup with 4 oz. of water in it and drink only one teaspoon, and he was achieving beautiful cures with this method, how come we use 8 to 10 pellets (the dosage indications on a 200C remedy bottle from Hahnemann labs for instance) as a single dose. It doesn’t quite make sense, since the 200C is ever so much stronger, how come we are administering it in such material doses (meaning using so many pellets, as I am well aware that the 200C itself is immaterial). Also the 30C pellets from Boiron and other manufacturers are very large, much larger than the poppyseed granule size that Hahnemann was using. The recommended dosage on the Boiron blue tubes is 2 to 3 pellets. This is way more than Hahnemann would have administered. Are people experiencing strong aggravations from the remedies, because we are giving them way too much of the remedy? I have no idea. It would be interesting for the homeopathic community to consider this issue. Hahnemann also taught that you should never repeat a remedy until you have seen that the remedy has exhausted its action. He believed that you should not interrupt a dose that is still active. Yet homeopaths today are repeating high potencies daily with no qualms, and claim to get positive results. I guess there are many ways to practice homeopathy, and no one has a monopoly on the truth. It would be nice, however, for homeopaths to take as much care as Hahnemann did with his dosing, holding the same ideals of gentle healing. French homeopaths are not allowed to prescribe over the 30C strength of the remedy by government decree. I used to feel sorry for them, thinking oh, too bad. They do not know about the wonderful powers of the high potencies. Now I am thinking too bad, for us, we do not understand the wonderful power of the low potencies. Working with LM potencies, I have begun to understand the tremendous power in the lower potencies – the power to heal in a gentle way. These days I often prescribe the lower range of the centesimal scale remedies, rather than the mid- range, as I would have in the past, and my clients are often healing without any aggravation at all. When I do prescribe the mid-range remedies, I am using fewer pellets than I used to. I am also seeing gentle healing happening on the LM potencies. Had I not had the experience of working with the LM potencies, and experiencing their wonderful power to heal in a gentle way, I would not have understood the real power of the low potency remedies in the graphic way that I do now. I have a perspective on posology that I did not have before, which I hope to continue to build on. A wonderful rule that I learned in the posology class that has helped me understand how to work with LM potencies better is a very simple one: If you see a strong amelioriation or a strong aggravation after a dose it is time to pause and wait. With LM potencies it is very important to determine the sensitivity level of the person to the remedy. For highly sensitive people the dosage size has to be reduced greatly. For these people I recommend triple diluting, and using a few drops to a quarter of a teaspoon of the remedy at each dilution level. When someone is highly sensitive they can overreact to the smallest stimulus, and can detect even a drop difference in the amount of the remedy given. If too much of the remedy is given they can have a strong aggravation. If the right amount is given they can experience gentle healing. It can take awhile to fine tune the remedy to the needs of a highly sensitive person. These directions are constantly evolving. I revise them as I gain more experience using LM or Quin Potencies. This is my latest revision. My goal is to make the instructions clear and and understandable. It has taken me many years to understand how to work with LM or Quin potencies safely. I appreciate any suggestions you have to improve them. against a book. (Note: It is best to take the remedy at the time of the day when you feel at your best. Please don’t take it at the same time you are eating. Give it about one hour away from meal times). Pour a teaspoon of liquid from the stock bottle into a cup with 4 oz. of water in it, and stir. (Please see Various Dosage Quantity Examples below to learn about adjusting the quantity you take to your needs). 3. Drink one teaspoon of the 4 oz. mixture (or the amount recommended by your homeopath). 4. Discard the remainder of the liquid on the ground, or pour the liquid into a sealed container that you can dispose of at your convenience. Please prepare the medicine in the bathroom, so as to avoid exposing other family members to the remedy, and set aside special cups and a spoon for this purpose. You may also use disposable cups. 5. Take only one dose and do not repeat the remedy. Please be in contact with me by sending me weekly progress reports in the first month of treatment. My goal is to identify two or three symptoms that we can use as markers that will help us determine when you should repeat the remedy. A single dose of an LM or Quin potency remedy can hold many months, and can potentially cure. These remedies need to be repeated with as much care and caution as when working with centesimal scale remedies. When repeated too soon, they can cause severe aggravations of your symptoms, which we want to do our best to avoid. Once we have identified the two or three symptoms that we are using as markers, we watch these symptoms for evidence of relapse. We would only repeat the remedy if these symptoms move backward for three or four days. You may also check with me to make sure the time is right. Some people benefit from taking the remedy daily. Some people take the remedy 2 times a week. Some people take the remedy once a week. Some people take the remedy once every two weeks. Some people take the remedy once a month. Some people take the remedy at 45, 60, 120, or 180 day intervals and longer. Some people need only one dose of the remedy in total. When you come close to the end of the stock bottle, please send me an e-mail to let me know. You can get the next bottle from Hahnemann Laboratories. Their phone number is 1-888-226-6483. You may also purchase the remedy from other reputable homeopathic pharmacies. Each time you order a bottle it has to be one strength higher than the previous bottle, so LM1 will be followed by LM2, and then LM3. Another thing that is important is that I will ask you not to completely finish the LM1 bottle, but leave about a teaspoon in the bottom. The reason for this is that for some people the LM2 from the pharmacy is too strong. In that case we can prepare an LM2 from the remains of what is in the LM1 bottle. I will explain how to do that. The LM1 is usually followed by the LM2, the LM3 and so forth, so that you move up consecutively in the sequence. From my experience, however, I have found that people may resonate better to certain potency levels than others. I can often test that intuitively when I see them in person. So for some people it is more beneficial to go from an LM1 to an LM3 and skip the LM2. Do We Have to Finish a Bottle Before Going to the Next Level Up? If you feel that the benefit from the remedy is plateauing, meaning that you do not experience increasing benefit from continuing with that dose of the remedy, it is okay to go up to the next level of the LM potency without finishing the bottle at the level where you are at. One teaspoon from the stock bottle into 4 oz. of water in a cup. Half a teaspoon from the stock bottle into 4 oz. of water in a cup. Double dilute by taking one teaspoon or half a teaspoon or a quarter of a teaspoon from the stock bottle and putting it in 4 oz. of water in a cup, stirring, and then transferring one teaspoon or half a teaspoon or a quarter of a teaspoon into another cup and stirring. Very sensitive people can also triple or quadruple dilute. The important thing is for you to determine how much and how often to take the remedy to keep the healing process moving forward, while keeping aggravations to a minimum. 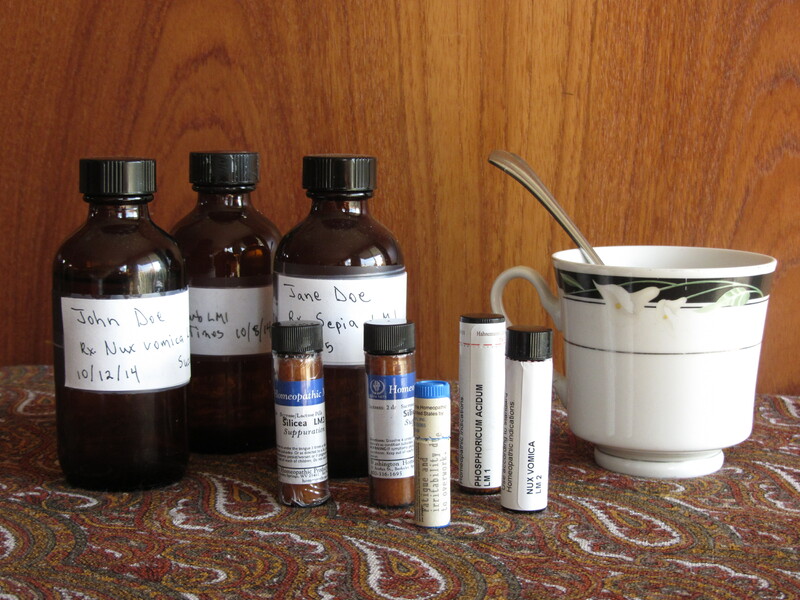 Aggravations can be reduced by decreasing the quantity of remedy used, and by double and triple diluting. People can definitely have aggravations of their symptoms on LM or Quin potencies equal and even exceeding in intensity to what people have on centesimal scale remedies. This is why dosage and frequency or repetition have to be monitored very carefully. Generally speaking an aggravations of symptoms is an indication that the remedy has found the symptoms it needs to work on and is working on them. It is important not to interrupt this process, but allow the aggravation to play itself out. The aggravation should be followed by an amelioration. The goal of using LM or Quin potencies is to keep the healing moving forward, while keeping the aggravations to a minimum. If you experience a strong aggravation of symptoms it can mean that you need to decrease the quantity of the dose the next time you take it. For example: go from 1 teaspoon from the stock bottle down to a 1/4 of a teaspoon from the stock bottle and triple dilute, transferring only a 1/4 of a teaspoon from each dilution cup. If you experience an amelioration of symptoms after taking a remedy, you should not repeat the remedy until the symptoms that have gotten better have relapsed for four to five days. Repeating before you are supposed to can trigger a strong aggravation that can take up to three weeks to recover from, so be careful. a) Give fewer succussions or shakes to the bottle. c) Use less than a full teaspoon from the stock bottle. d) Reduce the frequency of taking the dose. a) Increase the number of succussions to the bottle. b) Increase the frequency of taking the dose. c) Increase the number of teaspoons that you drink from the cup (not the stock bottle). The beauty of the LM or Quin potencies is that you can monitor yourself, preferably with the help of your homeopath, and take it when you need to. You are not supposed to develop a dependency on the remedy. It is designed to bring you to health and independence. When you no longer have any symptoms you may discontinue the remedy, and only resume if the symptoms start back up again. Please call or send me an e-mail if you have any questions about your response to the remedy, or whether you should start or stop. It usually takes people about four weeks to figure out exactly how best to take the remedy, so there is a learning curve. The goal is to keep aggravations to a minimum, while maintaining the effectiveness of the remedy. I would be happy to help you with fine tuning the remedy to your needs. I hope this remedy will help you feel better soon.